Love it, but this version has been out for a month now. @some guy. I hope this is helpful for you Buddy.... & Anyone Else..!! ..How I deal with Open Candy..
## Open Candy aint a threat unless it is installed ##. another warning, but again I Ignore it. me that OCandy is trying to be Installed. I Select "Clean" which moves the file OCsetuphlp.dll ..... into Quarantine. FIND it MEANS: It is lurking Inside a file & waiting to be Installed... "SHRED IT"
Do the same on ANY External drives which contain Apps. -Easily made portable. Without getting a portable version. I use it in HTML mode. (Whatever suits you)..!! Gives the basics of your Vid: Codec, Format, AR, Brate, audio, etc. For the full data of a vid, Hit the Debug tab & click Advanced. never Installed it. 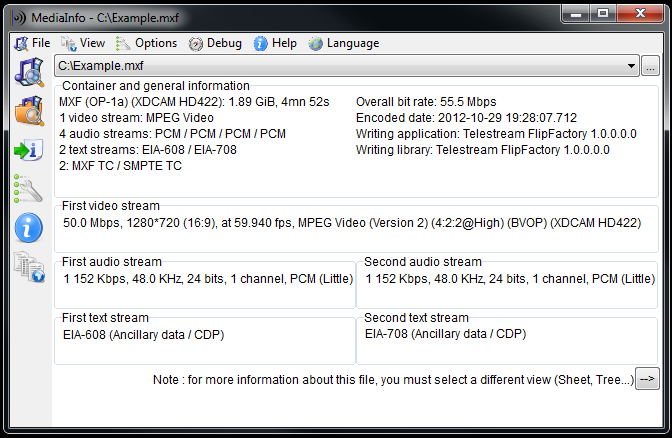 This app is more for the techy Encode/ReCoders. If you just use a Vid converter, then this app isn't really for you. Darn thing crashes like a jet flying over Lockerbie. Media Info is the right name. Really helpful. from the developper's page, download the zipped no-install file. The application itself is healthy and efficient. Infected with "Open Candy" malware! Some of the Chicken Little's here really need to do a little research. OpenCandy is not classified as malware (malicious software). It is considered adware. From ESET: "A potentially unwanted application is a program that contains adware, installs toolbars or has other unclear objectives. There are some situations where a user may feel that the benefits of a potentially unwanted application outweigh the risks. For this reason, ESET assigns them a lower-risk category than other types of malicious software, such as trojan horses or worms." All you have to do to avoid it is download the zip version. That they use OpenCandy may be annoying, but they clearly state that they use it on the program's home page. Following the "We use OpenCandy" link, leads to an F.A.Q. that includes an explanation of what it is, as well as a link to the zip version should you not want to install OpenCandy. Not so hard, is it? Although I guess it's much more fun to throw reason to the wind and respond with "OMG!! Malware, n00bs! ROFL!". 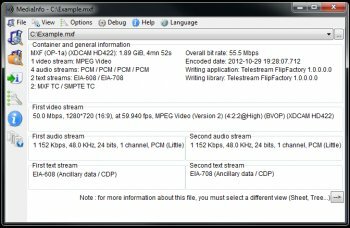 MediaInfo itself is an excellent source of info for just about any type of media file you have on your system. The GUI is OK, could be streamlined a bit. No, the standalone executable versions do not contain OpenCandy. But guess what? You know what you get when you click on that big "Download Now" button on the right? You get the installer that DOES contain OpenCandy. My only real objection is that it runs with no notice and no opt-out. Not cool. But really, whether or not this software packaging bothers you is something you can decide for yourself with a quick Google search investigating what this software is and what it does. Luckily, when others fill their "reviews" with cursing and name calling in a juvenile response to legitimate concerns, it does far more to discredit them than it does those they're railing against. I only use it portably from my send to menu. Anybody AFRAID(aghhh!!!) of open candy is a retard. BOTH the gui and lite zipped version DO NOT contain the open candy folder which any 5 yr old could easily erase-stupid ****s.
All the freely available software on the net will NEVER cater to any one individual for any reason-get used to it, write your own, or stop using it and stop posting your pathetic whinings. Yeah, if they want to add an option during installation for a sponsored toolbar or something, that'd be fine. But this OpenCandy stuff is very, very bad and installs automatically without non-fine-print notice to the user.